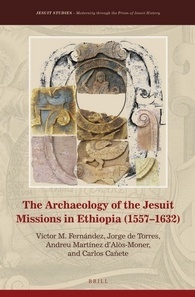 Brill’s Jesuit Studies book series has published its tenth volume, The Archaeology of the Jesuit Missions in Ethiopia (1557–1632). The text is published by four authors: Víctor M. Fernández of Universidad Complutense de Madrid, Jorge de Torres of the British Museum, Andreu Martínez d’Alòs-Moner of the University of Gondär, Ethiopia, and Carlos Cañete of the Centro de Ciencias Humanas y Sociales in Madrid. More information about this title, including a detailed table of contents, is available through Brill (http://www.brill.com/products/book/archaeology-jesuit-missions-ethiopia-1557-1632). More information about the Jesuit Studies book series is also available through Brill.